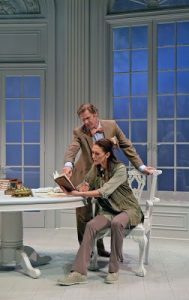 Palm Beach Dramaworks continues its 2016-2017 season with the challenging “Arcadia” by Tom Stoppard. 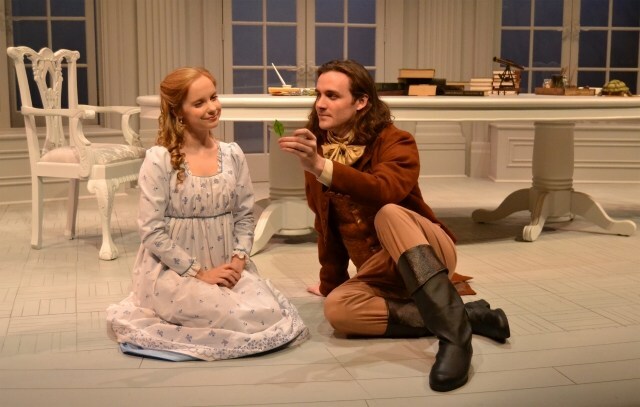 The play involves two groups of people living at the same English mansion centuries apart, each separately searching for solutions to academic and personal problems. The script challenges audiences with its dense, complex dialogue about math, science, and art, all of which is delivered in an unconventional way. These topics are spread about the play in between more personal discussions, but the script still dares the audience to keep up. A testament to this production’s quality, the cast and crew deliver the show with enough personal charm to each character so the audience can hang on, and with such confidence that any potential lack of comprehension is eventually cleared up. This script was no doubt a challenge for the playhouse, and they meet the challenge assuredly. Each of the major characters brings their characters to life in their own way. Caitlin Cohn gives 19th century Thomasina the thematically important thirst for knowledge while maintaining the character’s youthful innocence. Ryan Zachary Ward as her tutor Septimus plays off her well, believably imparting that desire to learn while simultaneously connecting with her emotionally and keeping a diplomatic air. In one scene, Septimus comforts Thomasina after she breaks down over the loss of the Library of Alexandria. This situation could have seemed over-the-top, but Cohn made Thomasina’s breakdown so realistic, and Ward so poignantly delivered Septimus’s monologue to comfort her, that it changed the way I think about apparent loss of progress. In the present day, Vanessa Morosco, Peter Simon Hilton, and Britt Michael Gordon serve as great foils for each other in terms of both ideologies and personality as Hanna, Bernard, and Valentine, respectively. Hilton stole every scene he appeared in with his larger than life personality. His expert comic timing brought a more upbeat, humorous tone to his scenes. Gordon, on the other hand, portrayed Valentine as more subdued but equally as passionate, creating great contrast. Morosco acted well as the midpoint between the two, still passionate and able to level with both characters without the explosive differences in personality the other two have. Dramaworks’ technical team continues their high caliber work here. The all white set had enough details to be interesting while providing a sort of blank canvas for everything to play out over. The costumes were also painstakingly period-accurate with every garment cut to the odd lengths which they used to be. Also worth a mention is the occasional subtle lighting effect, like the slight dim around the characters in the earlier mentioned Library of Alexandria scene. That effect in particular happened so slowly and sucked me into the scene so thoroughly that I didn’t even realize it was happening until it was over. Plot-wise there’s no final solution, per se, which fits the theme of the continuing search for knowledge. That sort of conclusion might turn some audiences off, but will feel complete on its own to others. In any case, Dramaworks knocks it out of the park with their production, so the play comes highly recommended for anyone willing to push themselves to engage with the material. 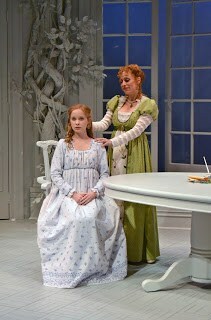 “Arcadia” runs through April 30. Tickets are $66 and can be purchased via phone at (561) 514-4042 or online at palmbeachdramaworks.org.